Tennis club evenings are on Thursdays and also on those Tuesdays in the Summer when there isn't a match; Thursday club sessions continue all Winter under the lights on courts 4&5. There is also a session on Sunday afternoons at 1:30 p.m. Visitors are always welcome (£5 per visit; £3 for juniors). You can play up to six times before we start asking you for a membership fee! There is also a very active club tennis morning every Wednesday and Thursday at 10:00 a.m. There are plenty of teams to try for. 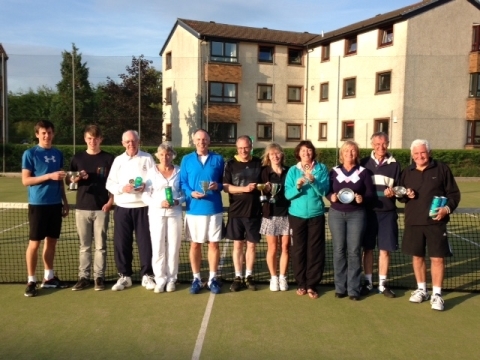 With men's and ladies teams in the Summer leagues, plus Vets, Cup and other competitions, there is always something going on. There are also Sunday afternoon tournaments, and other impromptu events. Keep an eye on this website for more information. A recent surprise email via the website, is this story of the first Craighelen Juniors, circa 1946. A frank and fascinating story from Iain G Campbell, now of Vancouver, who informs me that he carried on playing tennis for many years, and is now contemplating taking up bowls. An excellent advert for an active lifestyle! 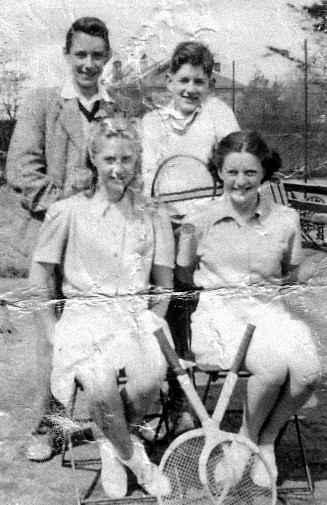 In early 1946 shortly before my tenth birthday and through no effort on my part I became one of the first junior members of Helensburgh’s Craighelen Tennis Club. When my father made the announcement he called it a prestigious club and while I was not sure what he thought that meant I was pretty certain that the club members would be snobs. It turned out that there were a few, but very few. Given that I had never played tennis my membership came as a complete surprise; especially since I thoroughly enjoyed the sports that I did play; football and grass hockey in the winter months and cricket in the summer. I even had hopes that someday I would play for the school teams and while I did make the football and hockey teams a place on the cricket team eluded me, except for a one month period in 1951 when I became the team’s twelfth man and in my case a seldom used substitute. Ironically I was certain that I could have made the starting eleven if I had being willing to give up Saturday tennis matches. Although the club was basically a mystery to me I knew that in 1946 it was a haunt for the socially elite and about the only business or social establishment in our upper-class bedroom town that had a parking area. After the war private cars were not common in Scotland but that fact was lost on most members of the tennis club. For the five years that I was a member it was never clear to me why the club changed years of tradition and enrolled junior members, although I did accept the suggestion that the decision had been made in The Station Bar, my grandfather’s pub, when my father met with the president of club; the word was that they were not entirely sober. Reasons aside I was a member, as was another chap, a good friend and next-door neighbour. On the first day of the season we arrived bright and early and we were greeted coolly but cordially by the club secretary who introduced us to two other juniors. That was confusing since I had not been told that there were others or that they were girls; an unexpected and initially unwelcome development. The young ladies were day pupils at St. Brides, an exclusive local private school. One was tall, pretty, blond and a stranger, the other, shorter with dark hair, had however been known to me for most of my ten years. By chance we had been born about the same time and our parents were acquainted. She had also attended Hermitage School before transferring to St. Brides. We did not really like each other. On that first morning, as directed, we were dressed correctly, totally in white; shorts, shirts, socks and shoes. My friend came equipped with a well-worn but serviceable tennis racket that belonged to his father while I had a brand new racket and wished that I had one like his. We did not bring tennis balls having been told that the club would supply them. Without consultation my mother had visited a Glasgow shop and bought me a racket, probably the only brand that came with a user’s manual; not one that could be ignored or read and set aside but one that was forever present. Incredibly the racket was printed with messages and hints on how to play the game. The most ludicrous being the declarations on each side, just where the handle joined the face, statements that annoyed me for years until the racket was mercifully replaced. It actually did not make the cut when I had to select a few personal items that were shipped ahead prior to our move to Vancouver in 1952. One side read Forehand Face and the other, logically, read Backhand Face. I knew no other player who had to be concerned that he or she might accidentally hit a ball with the wrong side of a racket and I could not imagine what might be the penalty for misuse. It did not get better, although the other instructions were less intrusive, could almost be ignored and some did in time wear off. The upper side of the shaft bore several messages: Eyes on the Ball; Concentrate; Follow Through; Stand on the Balls of Your Feet; etc. I no longer recall the messages on the lower side since they did not intrude as long as I was careful to hit the ball with the designated face and did not become left-handed; an unlikely choice since in 1946 that was barely permitted and never encouraged. The final insult was on the leather bound handle where dotted lines indicated the approved forehand and backhand grips, only of course for right-handed players. The tennis club employed a grounds-keeper who had grudgingly accepted the additional duties of coaching the newly minted members. Strangely, since he coached me for close to five years, I do not remember his name nor am I sure that I ever knew it. We called him ‘Sir’ and as I recall the senior members called him ‘Dutchy’. While I was certain that he did not appreciate his new responsibilities, I did come to value his coaching talents. Very early in our relationship he or the club executive decided that we should assist him with some of his duties and we were assigned much of the labour that kept two red clay courts in playable condition; there were also three grass courts but we were rarely permitted to play on them. Under his ever-watchful eye we swept the courts, raked the courts, rolled the courts and watered the courts. In time, when he was convinced that we could walk in a straight line, we were permitted to apply fresh lines to the courts. I am not convinced that he wanted us to work to lessen his load; I suspect that initially he hoped, and perhaps prayed, that a regular dose of hard labour would cause us to simply go away. Although I had no standard to judge him by, I believe that he was a good coach. He was never a friendly coach, seldom an encouraging or pleased coach but technically he seemed to be a good coach. He turned me into a confident tennis player who by the time I was thirteen was at ease playing with and against the senior members and I could beat many of them. I do remember his somewhat warped view of the game, a view that I easily adopted. It was beaten into us at a time when we barely knew how to hold our rackets; except for me, I of course had my ever-present user’s manual. His creed was: “You probably think that tennis is a game of hitting the ball forward and back, I am here to tell you it is not. When you hit the ball forward you do not want to see it again, you should pray that it never comes back”. I have never played a game without mentally reciting his words. He had teaching techniques that were either designed to improve our game or like the maintenance chores make us wish that we were somewhere else. One simple ploy was to have us play one against three, with the one playing into the singles court while protecting the doubles court. We very quickly learned that we could not play tennis by standing still. In another exercise he would hang a used tennis ball above our heads, just above the point where a ball should be tossed if we were to serve properly. We were required to toss balls endlessly until they just barely hit the hanging ball. He rightly insisted that we could not play tennis until we learned to serve and that we would never serve well until we learned to toss a ball consistently. A third exercise started out as torture and great became fun. In the late nineteen forties, tennis balls were not packed in vacuum tins, they came six to a cardboard box. Our coach saved these boxes and used then to develop remarkably accurate and unintentionally powerful services. He would stand them on end inside the service courts and part way along both sides of the centre line and the inner tram lines. We had to serve balls until all of the boxes had been knocked over. He did not care how long it took, or for that matter how dark it became; often summer rain was our only saviour. The service accuracy came from learning to hit the boxes and the power from trying to destroy them. Strangely a game that I never thought of playing became a minor obsession. During the school term I played every good weekend, in summer it was not unusual for me to play seven days a week and in winter I played indoors as often as possible at Shandon Hydro, a nearby hotel. A final note: During the time of my membership the club sat adjacent to a nursery of some kind and glass green houses and tennis balls did not get along. My recollection is that the owner would not let us retrieve errant balls even if they had not broken anything, nor would he toss them back. He did however turn up at the clubhouse on a semi regular basis with a basket full of balls. We assumed that there was a compensation negotiation with the club executive.